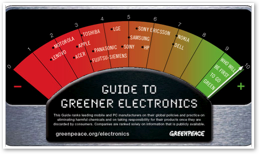 Greenpeace recently released their "Guide to Greener Electronics," rating fourteen consumer electronics vendors. Following in the same tradition as the Silicon Valley Toxics Coalition, Greenpeace issued a press release that specifically called attention to Apple and assigned the company a failing grade. Do the claims have any merit? The ranking is important because the amounts of toxic e-waste is [sic] growing everyday and it often ends up dumped in the developing world. Reducing the toxic chemicals in products reduces pollution from old products and makes recycling safer, easier and cheaper. 1) clean up their products by eliminating hazardous substances; and 2) takeback and recycle their products responsibly once they become obsolete. It is disappointing to see Apple ranking so low in the overall guide. They are meant to be world leaders in design and marketing, they should also be world leaders in environmental innovation. 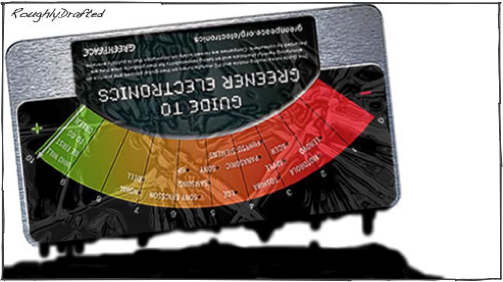 While the Greenpeace report attempted to rank vendors based upon useful and practical criteria, the actual scorecard and the methods used to collect information for their report were sloppy and incompetent. This should come as no surprise to anyone aware of Greenpeace activities. Greenpeace has worked to create awareness of important environmental issues since the 1970's, but their methods, accuracy, and effectiveness have ranged from controversial to comical to scandalous. 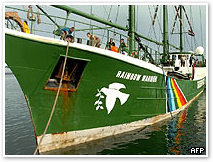 Greenpeace activism is based upon the simplification of complex political issues into epic battles between good and evil. Rather than devoting a lot of resources into educating the public, Greenpeace, like most political activist groups, tries to create sensationalist drama to grab attention and put simplistic issues in the headlines. This is pretty commonplace in politics; however, Greenpeace has an established history of playing fast and loose with facts in order to intensify their stories, and in some cases their pursuits' careless disregard for the truth has caused more damage than the evil they attempted to target. This happened quite literally last fall, when Greenpeace divers aboard the Rainbow Warrior II entered the Tubbataha Reef Marine Park, off the coast of the Philippines, in order to assess the effect of global warming. While discovering that the protected coral reef appeared to be healthy, Greenpeace managed to run their ship into the reef, damaging over a thousand square feet (100 sq m) of the protected coral. 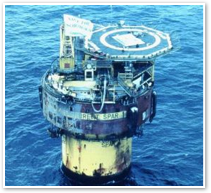 More famously, in 1995, after Shell oil obtained UK permits to sink their Brent Spar oil platform in the North Sea, Greenpeace activists boarded the platform and demanded Shell move the ocean platform to shore for dismantling, rather than dispose of it into deep ocean waters. Greenpeace disputed the three years of environmental reports Shell performed to determine the safest way to dispose of the structure, and accused Shell of misrepresenting the amount of oil remaining in it. Greenpeace claimed the Brent Spar contained more than 5,500 tons of oil, over one hundred times as much as Shell had reported. Greenpeace joined forces with dismantlers who stood to profit from towing the platform to shore, and incited boycotts and attacks against Shell stations and employees, particularly in Germany. Fifty gas stations were attacked, two were burned. The conflict cost Shell a quarter of a billion dollars. While creating a lot of drama, Greenpeace never actually presented facts proving that towing the platform to shore was an environmentally sound decision. Shell claimed that the amount spent, purportedly protect a small area of remote deep sea, was a huge waste of resources. Even worse, it turned out that Greenpeace was wrong in its estimates on the oil still remaining in the platform - there was actually a hundred times less oil than they insisted, just as Shell had reported. Not only did Greenpeace ineffectually and pointlessly cause a huge amount of damage, but it also destroyed its own credibility. Even worse, the event actually served to cast suspicion upon other environmentalists, including those interested more in protecting the Earth than in inflaming dramatic, televised standoffs. Given Greenpeace's reputation for seeking to create blockbuster spectacle rather than actual results, how well did their "Guide to Greener Electronics" report capture and portray facts and reality? The report's ranking criteria, available online, suggest that Greenpeace was reporting more on each vendor's web marketing savvy than their actual environmental record. Criteria included points for companies that had advertised a chemical policy and had published "policies" and "timelines" for phasing out the use of specific chemicals. Other points were awarded based on companies' own reports of the amounts of e-waste they collected and recycled, and their advertised takeback policies. Across the nine items, the report ranked each company either bad, partially bad, partially good, or good. The criteria report doesn't explain how "partially good" compares to "partially bad," but it is obvious that the ranking puts far more weight upon what companies publicly say rather than what they actually do. It is also clear that Greenpeace intended the report more as an attention getting stunt than a serious rating of corporations' actual responsibility. For example, Lenovo (IBM's former PC operation) was very poorly ranked across the board, but was specifically called out for tailoring their takeback programs to businesses rather than consumers. But that's because Lenovo primarily sells their premium brand ThinkPad laptops directly to business markets! Direct sales and lease agreements with businesses mean Lenovo's actual efforts to recycle are grossly undercounted. Lenovo's contracts with their volume clients involve takeback and recycling efforts that are not obvious to web surfers visiting the company's website. Businesses are far more likely to recycle their equipment than throw it in the trash, because they have professional staff maintaining a tight inventory for their fleets of PCs, and frequently upgrade systems on a fixed cycle. It's the low end consumer market that commonly ends up dumping their old electronic equipment improperly. The machines on the low end of the market are also the most toxic, due to their reliance on cheap CRT displays to hit a low price point. The vast majority of cheap PCs are pumped out by Dell and HP, supposedly the two "greenest" companies, according to the worthless Greenpeace report. Not only did Greenpeace fail to understand the real issues involved, but their data came primarily from manufacturers' websites rather than real research or third party auditing. Companies' ratings had little to do with their actions and more to do with their self congratulatory grandstanding: whether or not they had published policies or had made specific announcements. How worthless! The largest lingering omission from the Greenpeace report was the reality of market regulations. Barring some specific wrongdoing, individual companies simply don't act all that different because the cost of doing business is standardized by the open market. In a highly competitive market, one company can't act dramatically different than its peers. A manufacturing process that is better for the environment is not going to get adopted if it results in significantly higher costs. How "green" a tech company can be is largely dependent upon available technologies and their cost effectiveness. Smaller companies might be able to enact cleaner new technologies cost effectively on a small scale as more nimble competitors; larger companies might be able to afford to develop and deploy cleaner new technologies that others can't. The real solution to pushing adoption of environmentally sound technologies is for industries to agree on common elevated standards, such as the EPA Energy Star program, or for governments to demand that certain minimum standards be met. That enables all companies to compete fairly, and broadly applies known best practices throughout the industry, rather than only being enacted by a single company as a green advertising gimmick. And of course, that's how things actually work in the real world. The EU just passed the Restriction of Hazardous Substances, or RoHS, a strict new standard for chemical use in the manufacturing of consumer electronics. Anyone doing business in Europe will have to adopt the standard, so the individual PR blown out by certain companies is nothing more than a shameless grab to take credit for something everyone will be doing, whether they desire to be green or not. In 2005, we found that some RoHS compliant components were not yet available. Although we did not meet our goal for 2005, significant progress was made in transitioning HP’s product lines to RoHS compliance. 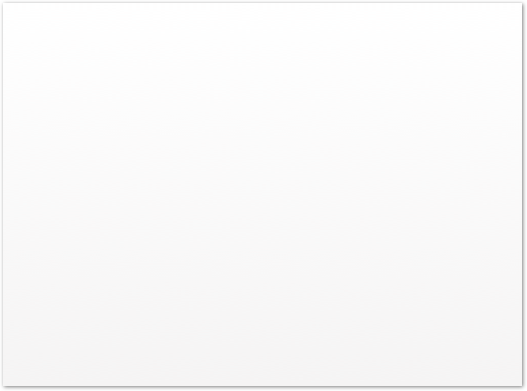 Apple products are compliant with the European Directive on the Restriction of the Use of Certain Hazardous Substances in Electrical and Electronic Equipment, also known as the RoHS directive. Examples of materials restricted by RoHS include lead, mercury, cadmium, hexavalent chromium, and PBB and PBDE flame retardants. 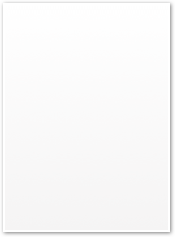 As a result of our precautionary approach to substances, Apple was able to meet many of the RoHS restrictions long before the July 2006 deadline. Despite the facts, Greenpeace ranks Apple “Partially Bad” but HP “Good” under the criterion of Chemical Management. What is Greenpeace smoking? Greenpeace ends up their report by demonstrating that it didn't really employ any factual, investigative reporting or actual comparisons based on merit. The final criterion of the report, and perhaps the only relevant, meaningful, and differentiating comparison they even considered, was a rating based on companies’ own reports of the e-waste they actually recycled. Companies that report on electronic waste recycling do so by providing annual or cumulative weight or units of electronic waste recycled. This metric does not allow an evaluation of how companies are doing based on (past) sales. It also makes it impossible to compare the recycling rates of different companies, given that every company makes a different portfolio of products of various weights e.g. mobiles only versus wide range of household appliances. Ideally, Greenpeace wants companies to report on recycling volumes/units based on the sales in year x (average age of the product when it becomes electronic waste). So, if the average age of a HP PC when it becomes waste is six years, we want HP to report how many PCs (units or weight) it recycled in 2006 based on sales of PCs in 2000 as a percentage. HP has devised a takeback metric based on % sales. Their 2006 Global Citizenship Report states that HP’s recycling/reuse volumes were 10.3% of sales. If every company adopted this metric, it would allow us to compare percentages of HP products recycled in 2006 (e.g. 10,3%) to other companies’ recycling rates. Top score goes to HP, the only company using a metric based on percentage sales. Wow! So despite being a top contributor to the PC e-trash problem, HP "wins" because they have a goal of taking back a tenth of the garbage they ship. That's about as many Macs as Apple sells. That means HP is not recycling nine times as many of their PCs as Apple manufacturers, every year! Is HP is "doing more" for the environment because they claim a lot of attention for their efforts? Perhaps Greenpeace is so enamored with HP because it shares the same drive to showboat stuff that doesn't matter. Why didn't Greenpeace consider the quality and resultant lifespan of products entering the market? That would have put trash PC dumpers like the highest rated HP and Dell on the bottom, and put premium vendors making products that last for many years, such as the low ranked Lenovo and Apple, at the top. Does it have anything to do with the fact that Apple is a household name, and that throwing stones at the Apple brand would be the easiest way to get their report noticed? It's telling that the report's press release specifically calls out Apple, and that Greenpeace "toxics campaigner" Iza Kruszewska felt it necessary include a quote about being “disappointed” that the group specifically had to rate Apple "so low in the overall guide." Clearly, Greenpeace is more interested in putting themselves in a lot of headlines, rather than in presenting real information on the state of the tech industry's environmental record, or in calling attention to the responsibility of consumers to make smart decisions that might actually have some impact on environmental issues. By shamelessly acting as another Apple parasite, Greenpeace not only distracts attention away from the smoke and mirrors deception of cheap, disposable PC makers' supposedly green efforts to profit on environmentalism, but also besmirches Apple's reputation and ignores their real actions taken to prevent toxic trash from ever needing any recycling. Even worse: nearly every news site on the Internet repeated the Greenpeace reports as factual, and presented it without any criticism.